Please be advised that the TORONTO 2015 Pan Am Games Closing Ceremony will take place on Sunday, July 26 at the Pan Am Ceremonies Venue (Rogers Centre). To ensure the venue can successfully operate and the athletes, coaches and officials arrive on time, a number of temporary traffic measures are needed in the downtown core and near the CIBC Pan Am/Parapan Am Athletes’ Village. All times subject to change. 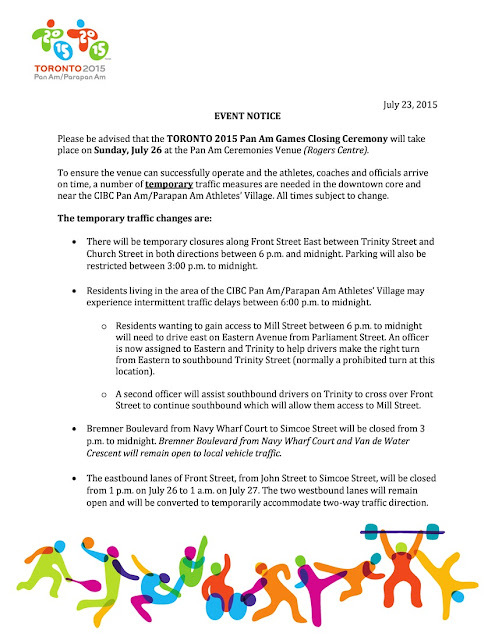 · There will be temporary closures along Front Street East between Trinity Street and Church Street in both directions between 6 p.m. and midnight. o Parking will also be restricted between 3:00 p.m. to midnight. · Residents living in the area of the CIBC Pan Am/Parapan Am Athletes’ Village may experience intermittent traffic delays between 6:00 p.m. to midnight. o Residents wanting to gain access to Mill Street between 6 p.m. to midnight will need to drive east on Eastern Avenue from Parliament Street. § An officer is now assigned to Eastern and Trinity to help drivers make the right turn from Eastern to southbound Trinity Street (normally a prohibited turn at this location). o A second officer will assist southbound drivers on Trinity to cross over Front Street to continue southbound which will allow them access to Mill Street. · Bremner Boulevard from Navy Wharf Court to Simcoe Street will be closed from 3 p.m. to midnight. o Bremner Boulevard from Navy Wharf Court and Van de Water Crescent will remain open to local vehicle traffic. · The eastbound lanes of Front Street, from John Street to Simcoe Street, will be closed from 1 p.m. on July 26 to 1 a.m. on July 27.
o The two westbound lanes will remain open and will be converted to temporarily accommodate two-way traffic direction. · Wellington Street, from Church Street to John Street, will be closed from 5:45 p.m. to midnight. 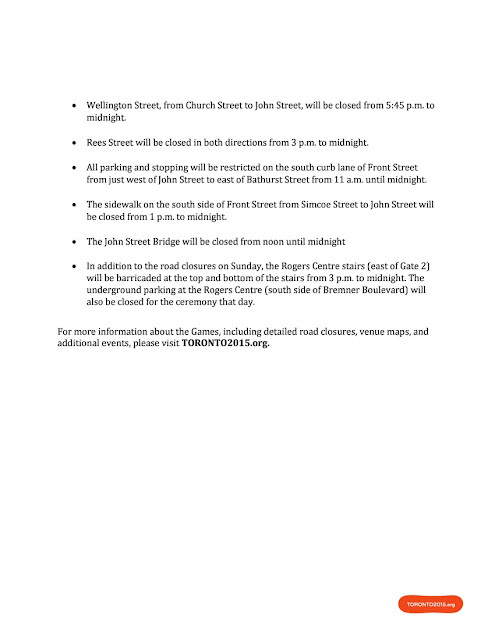 · Rees Street will be closed in both directions from 3 p.m. to midnight. · All parking and stopping will be restricted on the south curb lane of Front Street from just west of John Street to east of Bathurst Street from 11 a.m. until midnight. · The sidewalk on the south side of Front Street from Simcoe Street to John Street will be closed from 1 p.m. to midnight. · In addition to the road closures on Sunday, the Rogers Centre stairs (east of Gate 2) will be barricaded at the top and bottom of the stairs from 3 p.m. to midnight. o The underground parking at the Rogers Centre (south side of Bremner Boulevard) will also be closed for the ceremony that day. For more information about the Games, including detailed road closures, venue maps, and additional events, please visit TORONTO2015.org.